A bursa is a small jelly-like sac of fluid that sits between bone and soft tissue; there are many of them located around the body and their function is to reduce friction between two structures. When a bursa is irritated through excessive or abnormal stress, it can become inflamed. The greater trochanter is the bony prominence you can feel on the side of your hip. This part of the thigh bone sticks out because this is where many muscles attach. There are two bursae near the trochanter, namely the gluteus medius bursa and the trochanteric bursa. Both can become irritated and inflamed and are covered under the umbrella term of “trochanteric bursitis”. This condition usually starts with pain on the outside of the hip, which can radiate to the knee and/or the back of the thigh. It is often made worse by repetitive movements such as cycling, walking, getting into and out of cars, and walking up or down stairs. Certain people are more at risk of developing trochanteric bursitis; for example, it is shown that women are affected more often than men and those involved in repetitive sports such as running and speed walking have also been shown to have higher occurrences of the condition. 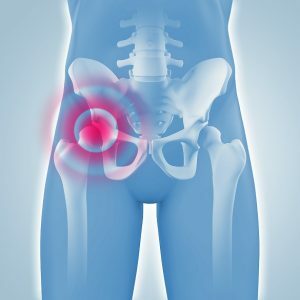 Previous hip injuries such as falls onto the side of the hip, bumping into furniture, or lying on the same side every night in bed without turning can predispose to trochanteric bursitis. Structural issues such as spinal arthritis, scoliosis or a leg length discrepancy can be considered as risk factors for this condition too. So, how is trochanteric bursitis treated? or cycling may require a period of relative rest and strengthening exercises of major muscle groups may be prescribed. Soft tissue release or massage by a qualified therapist can help by alleviating tightness and tension around the trochanteric bursa. When conservative treatment doesn’t seem to work, medical management may include corticosteroid injections or the use of anti-inflammatory drugs, either of which may be prescribed at the discretion of a medical doctor. Although trochanteric bursitis can be a relatively straightforward condition to treat, as always, prevention is better than the cure. Planning an appropriate exercise regime that incorporates graduated strength and conditioning exercises is key in order to maintain healthy tissues and prevent painful conditions such as trochanteric bursitis. Speak to your physiotherapist for more information.